The title of Elaine Neil Orr’s second novel, “Swimming Between Worlds,” is in manyways a description of what she’s been doing throughout her life – a life that she has now reflected upon in different ways in a memoir and two historical novels. Orr is a professor of English at N.C. State University in Raleigh. She’s a fair-haired white woman with a gentle North Carolina accent, a wife and mother, living a comfortable, refined and thoroughly American life. She’s also an African, in her heart and in her experience. It’s her life in those two worlds that she tries to understand when she writes, and what she’s learned through that writing is what drives her novels. Orr was born in the mid 1950s in a Nigerian village, the daughter of Southern Baptist medical missionaries. Except for a year when she was 6 and her parents were on sabbatical in Winston-Salem, N.C., she spent her childhood in Nigeria, amid the national movement that would lead to independence from Great Britain. Growing up in a Nigerian village, she first became aware of the civil-rights movement that was erupting in violence in the United States – her “home” of record – as an outsider, through the eyes of the Nigerians her family dealt with daily. “It was in Eku, Nigeria, when I was 8,” she recalled recently. “Nursing schoolstudents at the hospital where my parents were stationed saw the cover of Time magazine with the image of police officers in Alabama violating black young people with fire hoses and dogs. They staged their own strike, demanding that themissionaries explain why their ‘brothers and sisters’ in America were violentlyattacking children. That incident doesn’t appear as such in Orr’s new novel. “Swimming Between Worlds” isn’t autobiographical in the usual sense of the word; it’s not about a youngAmerican missionary daughter growing up in Nigeria. Rather, it’s a coming-of-age and love story about a young Southern American white man, Tacker Hart, who comes to Nigeria as a recent college graduate in 1959. Even though he’s grown up inNorth Carolina, Tacker first becomes aware of the American Civil Rights movement while in Africa. And then when he’s sent back to Winston-Salem in disgrace, his new awareness makes him unable to slide back into the accepted patterns of his life. Orr did live in Winston-Salem during the time portrayed in the novel – in the same house she has Tacker rent in her story – but as a sheltered young child, she was unaware of the civil-rights demonstrations. When Orr was sent to the American South as a teenager for high school and college, she was plunged into a world of racial strife, segregation and activism, a world in which she did not seem to belong. 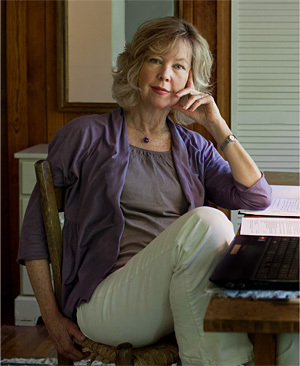 Before she tried fiction, Orr wrote a memoir. Most of her writing to that point had been academic, but when she was in her 40s, a life-threatening illness interrupted her career. Facing end-stage renal disease, waiting for kidney and pancreas transplants, she didwhat she’d never taken the time to do before: write about her African life. The result was “Gods of Noonday: A White Girl’s African Life,” published in 2003 bythe University of Virginia Press. In it, Orr writes about becoming aware of her dual roots. She grew up half American, half Nigerian, drawing on both Christian and Yoruba spirituality, American and Nigerian ways of looking at the world. Writing the memoir helped her, but Orr still had more to do to understand the two worlds that had shaped her. That’s when she moved from memoir to fiction. Orr’s mother gave her amimeographed copy of the unpublished diary of Lurana Davis Bowen, the first woman Southern Baptist missionary to Africa. As a girl, Lurana lived in Georgia before the American Civil War, in a slave-owning family. Idealistic, she married an older man who was a missionary and accompanied him to Nigeria. She founded the mission in the town where Orr was born 100 years later. Lurana’s husband eventually died “rather ingloriously” in a mental institution inGeorgia, and Lurana’s story was not one Southern Baptists cared to publicize. The result is “A Different Sun,” a historical novel published in 2013. On the surface,the novel can’t be autobiographical. It’s about a white woman who grew up in the antebellum South and went to Nigeria as an adult missionary. Orr grew up in Nigeria in a missionary family, then went to the American South during the civil-rights movement for high school and college. “There is something autobiographical in ‘A Different Sun’ that is slant,” she said. “In many ways, I was a daughter trying to understand her mother, who had alwaysbeen an enigma to me,” she said. Having experienced the deep spirituality of the Yoruba people, Orr had struggled with the idea that they needed to be become Christians. Growing up, Orr understood the message of the Gospel, about helping the poor and healing the sick and being agood person. But she did not understand “piety,” or a need to convert people toChristianity. In “A Different Sun,” Emma Bowman eventually comes to realize that she is learningfrom the Africans she came to enlighten, and that their religion is valuable, whether or not they blend it with the Christianity being offered to them. Orr said that as she tried to get into Emma’s mind, she understood her motherbetter than she ever had, better than she had when writing about her in the memoir.“The novel is much more compassionate toward my mother than my memoir, inwhich I speak much more frankly about my sense of abandonment because shewasn’t always present,” she said. Now in her new novel, “Swimming Between Worlds,” she revisits many of the same themes, only this time set a century later, in the 1960s. But she takes seriously the need to make whatever she works into her fiction“plausible.” She paid meticulous attention to the details of architectural education and licensing, for example. There is more than one kind of historical novel, Orr said. She mentioned “Varina,”the new novel by Charles Frazier, a fellow North Carolinian, whose main character isJefferson Davis’ wife, a historical character about whom much is known. “There is agreat deal of imaginative material in there because there were gaps, but in manyways he had to stick to the story,” she said. For the most part, though, she took great pains to get the names and locations of streets and buildings right. Though Tacker and his closest associates are fictional, actual historical figures do appear in the book. Orr called some by their real names and gave made-up names to others. Martin Luther King Jr.; Carl Matthews, one of the primary African-American leaders of the Winston-Salem sit-ins; and Alan Vaughan-Richards, an architect in Nigeria, appear briefly as themselves. The Rev. Billy Graham and Susanne Wenger, an Austrian artist who lived in Nigeria, appear under fictional names. About the interviewer: Linda C. Brinson, former editorial page editor of the Winston-Salem Journal, is a freelance writer and editor and an adjunct faculty member in the University of North Carolina at Chapel Hill’s School of Journalism and Mass Communication.